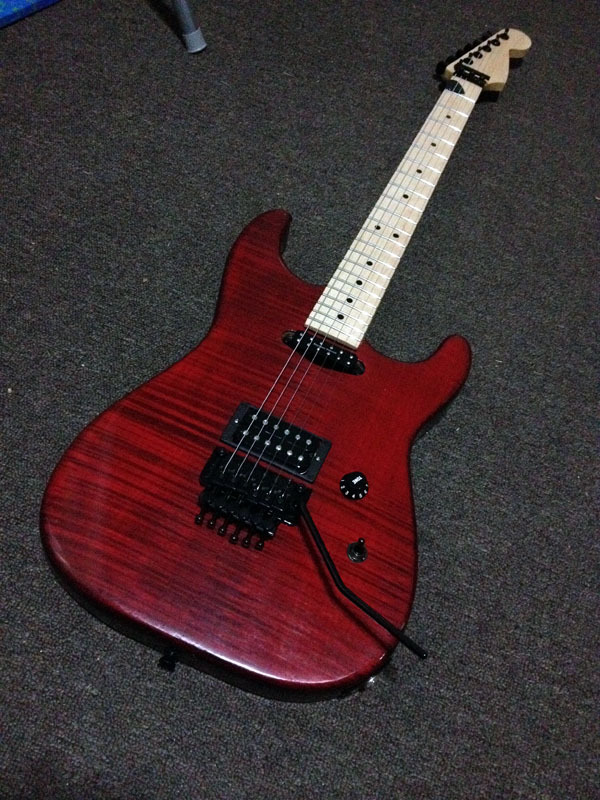 The Charvel build project updates have been very quiet as of late. To get you up to speed, In the three months since I last provided an update on the Charvel build project I have sprayed clear coat on the body, and left it to cure. Two weeks ago I decided it was probably about time to get onto finishing up the body and putting the guitar together. 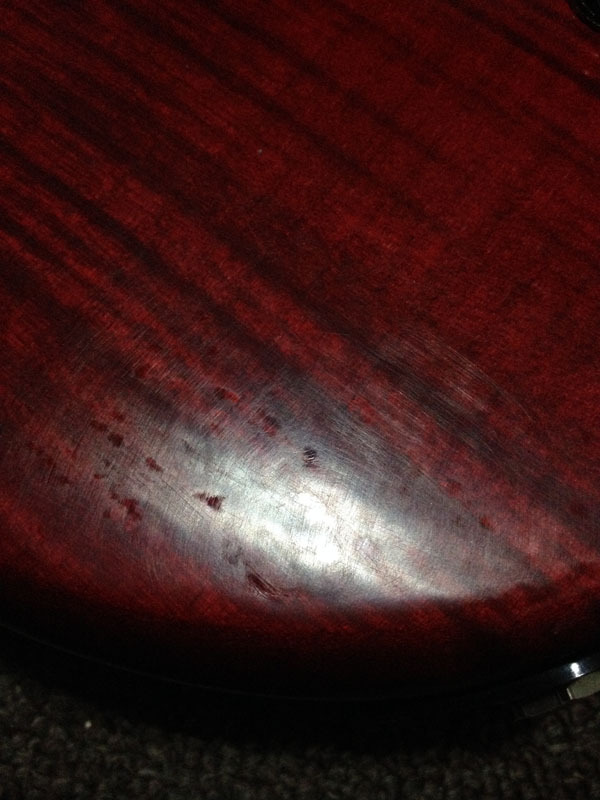 First up was wet sanding the guitar. I picked up a range of wet sanding paper, from 400 grit through to 2000, and let it soak overnight in a container of soapy water. The next morning I got started on sorting out the orange peel and couple of runs that were on the body with the 400 grit. Unfortunately, very early on I realised that the clear coat was not nearly as robust as I needed it to be for a guitar body. Some simple tapping on objects was leaving dents in the clear coat. I was quite disheartened by this as I had spent so much time working on the guitar body, and for the clear to not work out was extremely frustrating. I don’t currently have the time or money to try and rectify it right now, so I just decided to give the body a quick once over with the sand paper and cutting compound and put it together. There’s still plenty of orange peel and scratches in the clear, but it’s not noticeable unless you look close up in the light. And here are a couple of shots that really show how bad the clear is. I hope at the end of the year that I’ll be able to rectify it. The guitar is loaded up with the Floyd Rose from a Charvel Pro Mod series guitar and Killer Guitar Components 37mm Floyd Rose® Original brass tremolo block since the stock 32mm one was too short for the cavity. I also have a Killer Guitar Components Killer brass neck plate, which is a very nice touch. The pickups are my customised Seymour Duncan Custom Shop IM1 in the bridge and Seymour Duncan Little ’59 for Strat in the neck. 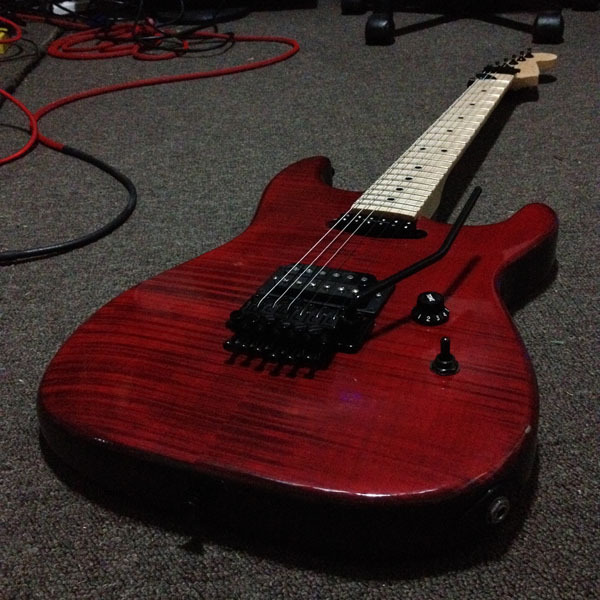 The IM1 sounds brilliant, although that might go back into my Strat build project guitar, which currently houses a Seymour Duncan Perpetual Burn Jason Becker signature humbucker that I’m testing for review on the Seymour Duncan blog. 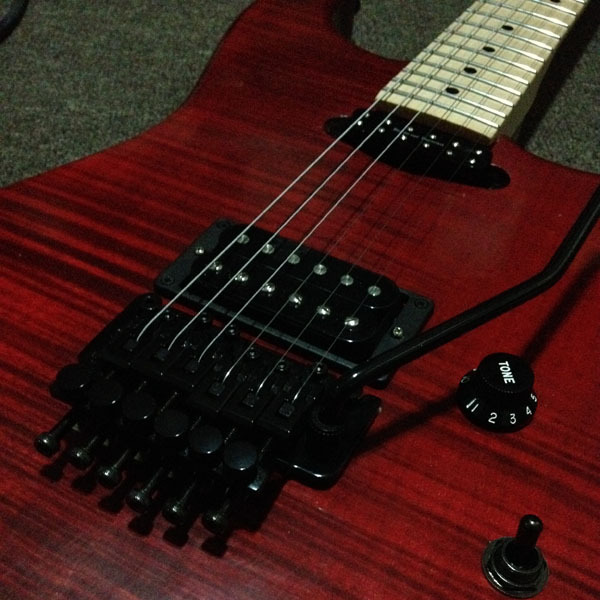 I originally got a Full Shred bridge for the project, and that may very well go in soon. The guitar plays brilliantly. I was able to get some crazy low action with a shim in the neck pocket, and the only thing left to do is adjust the truss rod once I get a 4mm ball end t handle allen key that I have on order. I’ll try and get a quick YouTube demo of the guitar sorted soon. 5 Responses to "The Charvel build project – part 6"
I noticed you said you were going to, or thought about using Stainless frets on the neck in the first part of this series. I’m wondering if the neck has stainless frets? If so, did you have to do any work on the frets to get them level, etc, ? 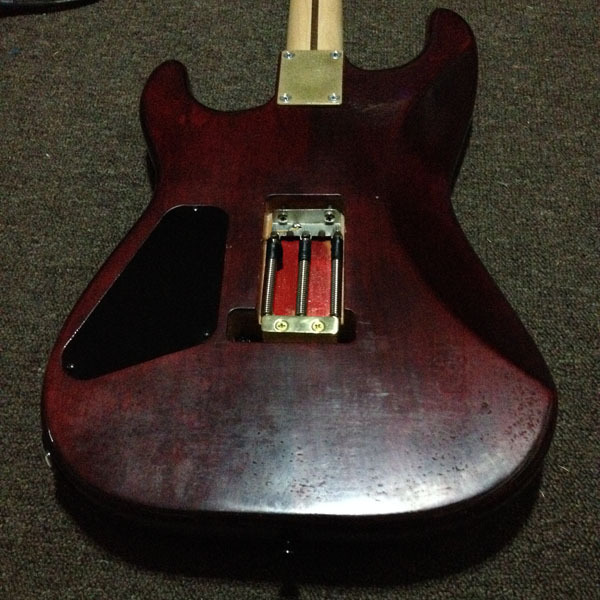 The neck on a guitar is the most important part to me as well as the pickups. 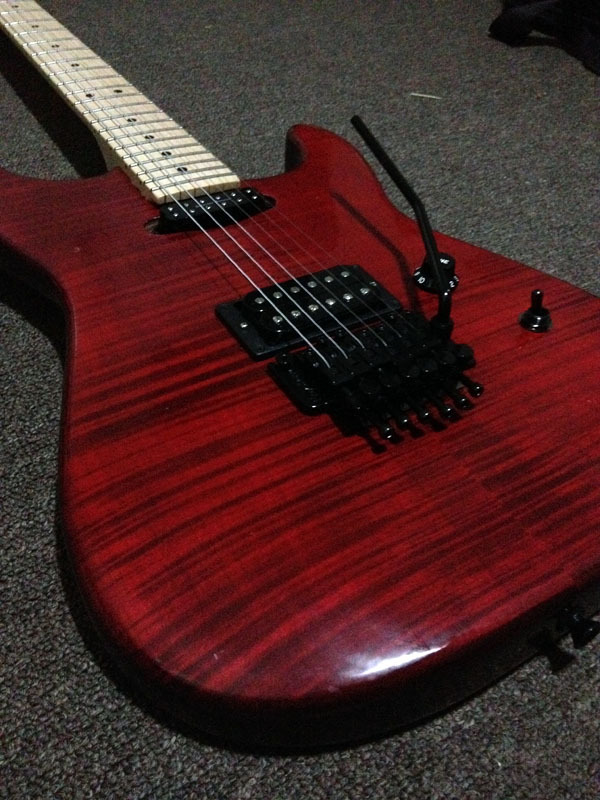 I ask all this because I’m considering building a charvel / strat hybrid that fits my needs. I’m going to build on a standard body with hard tail bridge, or a standard 6 screw trem strat traditional bridge and on a body rear routed with two hums. 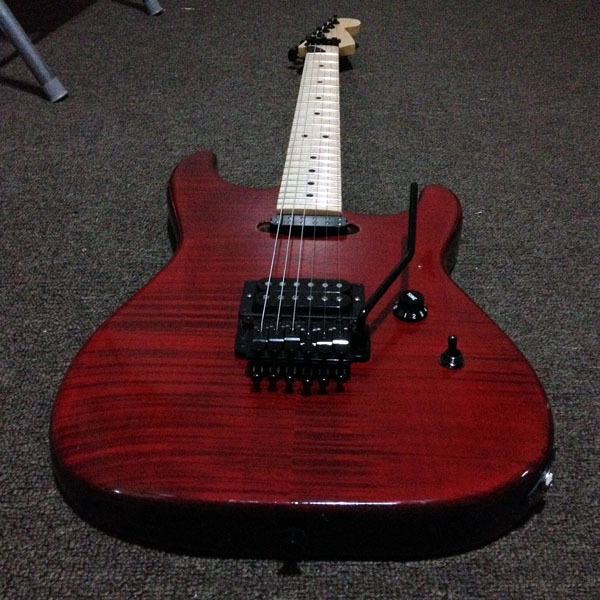 I’ve not decided on the trem or hardtail, but I’ll use a used body if I can find a good charvel or jackson body online. I’m also going to paint my body with just sparkle paint from the can. I painted a Gibson LP flatop guitar I purchased from “precsionguitarkits.com” and it came out great. It was like 20 bucks to buy a paint kit that is the flip flop paint such as that used on the old Kramer guitars when I was a young man in the 80’s. Anyway, my main question is about the stainless frets on the neck you purchased and if you had to do any other work on the neck to insure the fretwork is good? Hi Tim, I was lucky when I got my stainless steel fret loaded neck in that they were pretty much good to go. I haven’t had to do anything with them and the neck plays really nicely. Hi im planning the same build, how much did it cost you for the neck and body?